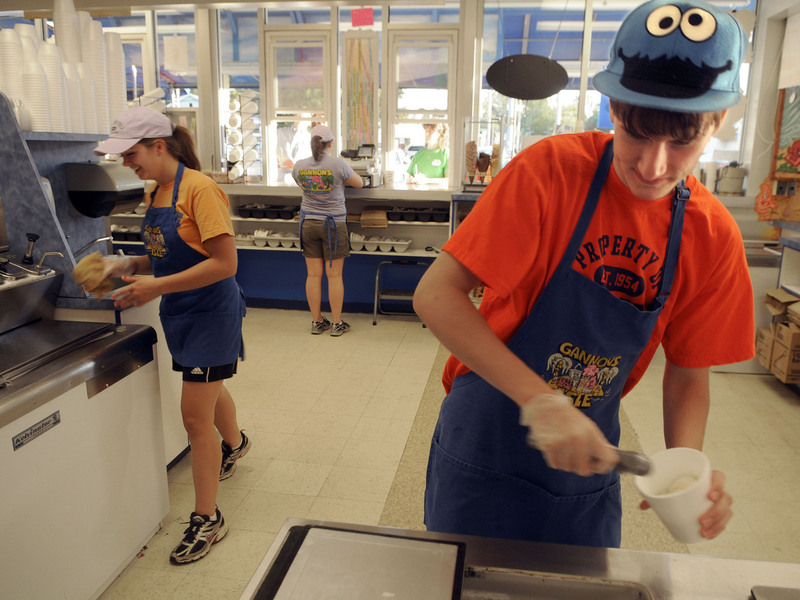 For Many Teens, Summer Jobs May Be Thing Of The Past : The Two-Way A recession and its lingering effects have made it even harder for teens to find summer employment. But the drop off in teen summer hiring predates the recession. Tom Auffhammer, 17 (right) scoops ice cream in Syracuse, N.Y. Teens continue to face stiff competition for summer jobs, but a downward trend in summer hiring for teens actually predates the recession. The school year's winding down, meaning teenagers around the country will soon be trying to pull in some extra cash scooping ice cream or manning those kiosks at the mall. But with the job market still weak, teens are facing stiff competition landing summer jobs. And while the downturn has hit young job seekers particularly hard, it's not just the lingering effects of the Great Recession working against them: the drop-off in teen summer hiring actually began long before 2007. The past two summers were the worst for teen employment in the U.S. since the Bureau of Labor Statistics began measuring just after the end of World War II, according to a new report from the Center for Labor Market Studies at Northeastern University. Just under 30 percent of U.S. teens had jobs in the summers of 2010 and 2011, down sharply from 42.6 percent in 2006 before the recession began — and a far cry from the heady summers of the late 1940s, when over half of the nation's teens were employed. And the outlook for 2012 isn't much better, according to the center's director, Andrew Sum. He projects this year's rate may even hit another post-World War II low. "We heard that many employers told kids last summer, 'Don't even bother filing an application next year,'" Sum says. Employment rates represent June-through-August averages for each year. The employment firm Challenger, Gray and Christmas expects a slightly brighter outlook for teens this summer compared to 2011, but the firm still expects any gains to fall short of pre-recession hiring. The employment picture, of course, has been grim for workers of all ages year-round since the economic downturn began, but teens have been hit particularly hard. This year, Challenger, Gray and Christmas says 1.3 million 16- to 19-year-olds will be looking for work — and the firm predicts another 1.1 million or more have given up the hunt entirely. And with another round of anemic job growth numbers expected Friday, teens can expect another summer of "enormous competition" when they go out to look for work, says Sum. With little or no job experience, teens are always at a disadvantage on the job market. But with a burgeoning number of college graduates and college students looking for work, they're facing stiff competition — even for the low-wage retail and food service jobs teens have traditionally held through the summer months. And teenagers, like recent college grads, are also competing with a growing number of unemployed older adults displaced during the recession, which technically began in December 2007 and ended in early summer 2009. But while the recession and weak recovery have hit teens hard, the drop-off in summer hiring for teens predates the downturn. The employment rate for 16- to 19-year-olds in July, the peak month for summer employment, began falling in 2000, according to data from the Bureau of Labor Statistics. "Employers have massively altered how they treat the summer," Sum says. The summer job market, robust in the '70s and '80s, "just started to fall apart in the '90s," Sum says. "After that, it grew smaller year after year." As reliance on contract hiring has grown alongside unemployment, more firms are choosing to employ adults who are available to work throughout the year, Sum says. Financial companies and employers in blue collar industries also started cutting back on teen hiring years ago, Sum says. The upshot? More firms are choosing not to do any summer hiring at all. It's no longer unusual, Sum says, to hear from employers who haven't hired a single teenager in several years. Parents may wax nostalgic about summer days spent lifeguarding or steamy nights slinging burgers, but millions of today's teens may never have the opportunity to look back – fondly or otherwise — on summer job memories of their own.